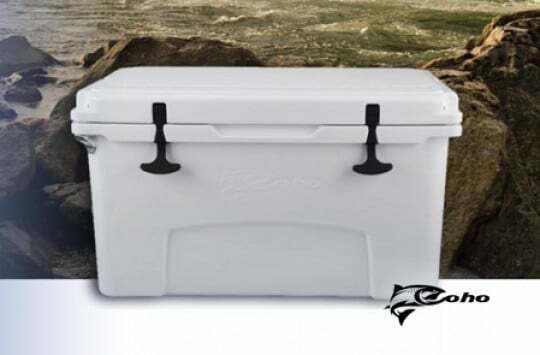 The Coleman line of coolers is one of the most common and popular ones around. Ask most adults and they probably remember going on camping trips with a Coleman cooler in tow. If you have come to recognize the Coleman brand as one that you like and trust, and are looking to pick up the best Coleman cooler for your needs, then stick around as you’ll really enjoy what we have for you. We’ve scoured the internet and looked at the many different coolers out there. We have looked even more closely at the Coleman line of coolers and now bring you our top Coleman cooler reviews. Offered in a variety of coolers such as green, red or silver, when you take a look at these coolers it’ll be like taking a step back in time. For many, one glance is all they need to start reminiscing about campfire cookouts or barbeques on the beach. This cooler comes in one size and holds 85 cans (over three cases! ), has stainless-steel handles and rubber grips over them for ease while transporting, and a solid latch to keep the cold in, and the heat out. While these coolers look much like the ones you may have remembered, today’s coolers are fashioned differently. The outer shell is indeed metal, but the inside is what you would find with other coolers, which is insulated plastic. It’s best to check its hi-res pictures on Amazon to see how it’s made and how does it look lie. Many users report using this as much as the Coleman coolers they were used to growing up, though some mentioned that a few items have changed such as the latch sliding into a plastic hook rather than a metal one. Several also mentioned that these did not have a bottle opener as the older models had years ago. As with any model or line of products that have been around for decades, newer models and designs can be found, which is what we find with the Coleman Steel Belted Cooler Review. If you are on a budget and need a good cooler for your cold beverage needs, then you may want to check out this Coleman ice chest. Coming in at red or blue, you have definitely seen one these around somewhere. You may have not known it was a Coleman, but in all likelihood it probably was. The Coleman 48 quart cooler (available here) can hold 63 cans and is also tall enough to accommodate 2-liter bottles standing upright, which makes things so much better. This larger sized cooler features a hinged lid for easy opening and a leak-resistant drain, making your life easier when emptying and cleaning. While this cooler may not be able to hold ice for a week at a time like some of the other coolers on the market, the durability and way these were constructed is something to marvel at. There are several users who have reported owning these for years with little degrading over time. One individual reported having the same coolers for a little over 20 years and still getting use out of them. If you are looking for the best Coleman cooler that will last over the long haul (think decades), then you may want to give the Coleman 48 quart cooler a second look. If you are looking for an even larger sized best Coleman cooler, then this will most certainly meet your needs. This Xtreme cooler can hold 98 cans plus ice, which means that you can fit nearly four cases of drinks in the cooler and still have room for ice. This is the perfect addition for any party or gathering. You’ll be able to easily hydrate friends and family at your next barbeque or tailgate party. The two way handles on this model also make it easy to carry and transport, however at such a large size you may want to get some extra help moving this around. Coleman also reports that this may just be one of the best Coleman coolers that will be able to hold ice. The Coleman ice chest states that it can hold ice for up to five days, even in extreme weather. Users tend to comment on that in their reviews on Amazon. One user put the Xtreme through its paces and reported that the cooler performs as advertised. Utilizing one-gallon jugs with frozen water as ice, the user got six days of safe cold use, with one of the gallon jugs still half frozen after six days. 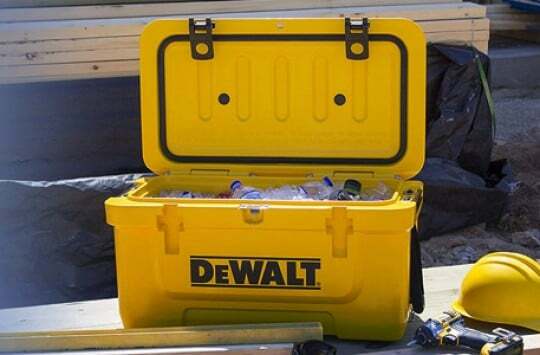 Other individuals have reported that while the construction of the cooler may not be as they expected after use, it does hold the cold in and ice for a while, which is what users are after when you think about it. If you are traveling and don’t have the time or the convenience to pick up ice on a somewhat regular basis, BUT still need to keep food and drinks cold, then you may want to think about picking this little beauty up. You can easily fit 44 beverages in this cooler along with snacks. The adjustable door can open on the right or left, so you can adjust as your needs require, either in the car or out of it. The various power supplies offered make this the seamless choice to go from vehicle to tailgate to cabin. Some users have reported trips that included extended time between vehicles and cabins, with the Coleman Electric Iceless Cooler performing as expected. You can plug this into your cigarette lighter in the car while on the road, then plug it right into the wall when you arrive at your destination. In fact, you don’t even need to be camping to enjoy using this cooler. It’s perfect for the office or any dorm room. TIP: Check also our latest post regarding the new Coleman product line: Esky Cooler. Best Coleman Cooler – So What’s The Bottom Line? The bottom line is your needs. Are you just looking for a cooler for the day? Then you may want to try out the Coleman Steel Belted Cooler. Do you need something a little bigger that can hold ice for several days on your next camping trip? Then you may want to give the Coleman 70-Quart Xtreme cooler a try. Need something on a regular basis, but don’t have the time or convenience to pick up ice? Then you may want to pick up the Coleman Iceless Cooler. If you are impressed with the Coleman line and are looking to pick up a Coleman ice chest, then the best Coleman cooler for you will be the one that suits your needs best. We’re sure that one of these on this list will meet your needs and then some.